First time I made this soup I did it without the white beans and saffron but I felt in need something, my boyfriend suggested the beans – perfect, and I added Saffron; I think it’s about right now. This soup would be great to get lots of super healthy kale into a loved one who might prefer lots of sausage =). The sausage I used is McLean’s Organic Chorizo Pork Sausage. If I need a processed meat that I can’t get from my butcher I like to use Mclean Organic Foods. Their deli line is made from meat that was produced without growth hormones, antibiotics, and from farms that meet an animal welfare criteria. Their products are free of common allergens, food additives and are organic too! Cook onion with oil in heavy bottom pot over moderate heat until translucent and just golden. Add garlic and sliced potatoes and cook, stirring occasionally for 4 minutes. Add broth and sea salt to taste and simmer until potatoes are tender, about 15 minutes. Meanwhile, sauté chorizo in skillet over moderately high heat until browned. Transfer to paper towels to drain. Coarsely mash potatoes in soup with a potato masher. Stir in white beans, chorizo, paprika, saffron and simmer 5 minutes. Stir in kale and simmer until just tender. The cholesterol-lowering ability of collard greens may be the greatest of all commonly eaten cruciferous vegetables. In a recent study, steamed collard greens outshined steamed kale, mustard greens, broccoli, brussels sprouts, and cabbage in terms of its ability to bind bile acids in the digestive tract. When this bile acid binding takes place, it is easier for the bile acids to be excreted from the body. Since bile acids are made from cholesterol, the net impact of this bile acid binding is a lowering of the body’s cholesterol level. It’s worth noting that steamed collards show much greater bile acid binding ability than raw collards. Unlike broccoli and kale and cabbage, you won’t find many research studies devoted to the specific health benefits of collard greens. However, collard greens are sometimes included in a longer list of cruciferous vegetables that are lumped together and examined for the health benefits they provide. Based on a very small number of studies looking specifically at collard greens, and a larger number of studies looking at cruciferous vegetables as a group (and including collard greens on the list of vegetables studied), cancer prevention appears to be a standout area for collard greens with respect to their health benefits. This connection between collard greens and cancer prevention should not be surprising since collard greens provide special nutrient support for three body systems that are closely connected with cancer development as well as cancer prevention. These three systems are (1) the body’s detox system, (2) its antioxidant system, and (3) its inflammatory/anti-inflammatory system. Chronic imbalances in any of these three systems can increase risk of cancer, and when imbalances in all three systems occur simultaneously, the risk of cancer increases significantly. Among all types of cancer, prevention of the following cancer types is most closely associated with intake of collard greens: bladder cancer, breast cancer, colon cancer, lung cancer, prostate cancer, and ovarian cancer. If you want to include collard greens and other cruciferous vegetables you eat on a regular basis to receive the fantastic health benefits provided then, at a minimum, have 2-3 servings per week, and make the serving size at least 1-1/2 cups. 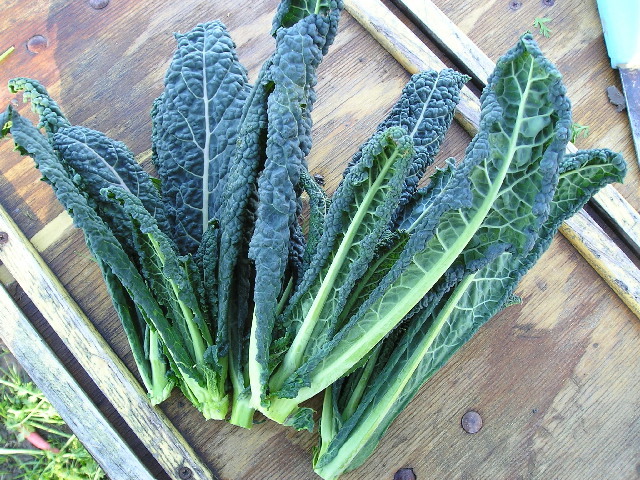 Try using collard greens in place of spinach, like in egg scrambles, soups, stir frys even as wraps! They stay much firmer and don’t have a very strong taste. It is very important not to overcook collard greens. Like other cruciferous vegetables overcooked collard greens will begin to emit the unpleasant sulfur smell associated with overcooking. To help collard greens to cook more quickly, evenly slice the leaves into ½-inch slices and the stems into 1/4-inch pieces. Let them sit for at least 5 minutes to bring out the health-promoting qualities and steam for 5 minutes. Arugula aka “Rocket” is a dark leafy green in the cruciferous family of vegetables. It is closely related to broccoli, cauliflower, bok choy, and brussel sprouts, amoung some of the most potent anti-cancer foods around. Of all the salad greens, arugula is one of the most nutritious, it is packed with disease-fighting phytochemicals, vitamins, and minerals.It has a peppery, mustardy flavor with a slight bitterness. Younger leaves, known as baby arugula, are more tender and less pungent than the more mature greens. 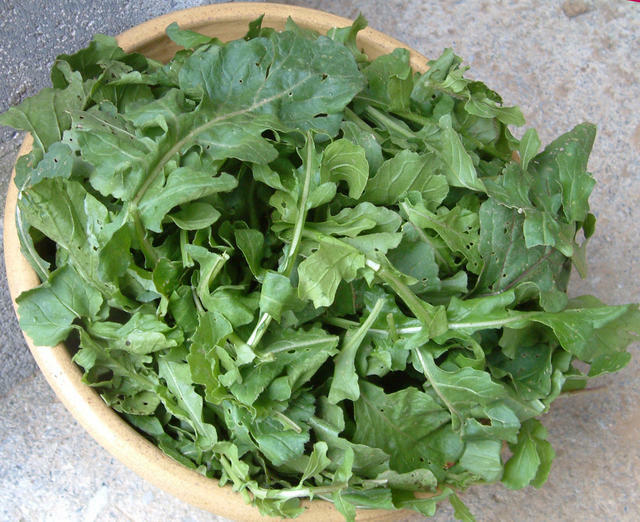 Arugula leaves are shaped like oak leaves or dandelion greens. A serving size of five cups provides a good portion of vitamins and minerals; one cup only offers a fraction. Still, arugula greens provide a readily absorbable source of calcium, iron, manganese, copper, and potassium. It is also a good source of vitamins A, C, K, and folic acid. Arugula is also a great source of chlorophyll, a compound that the body can always benefit from. Chlorophyll cleanses and energizes the blood. It helps bring large amounts of oxygen to all parts of the body, creating an environment undesirable to viruses and harmful bacteria. Chlorophyll also supports healthy skin, and limits the potential of carcinogens. Best way to eat Arugula for health benefits is raw. Full of flavor, arugula is great as a salad green, baby greens alone or mixed with milder greens, toss with a simple vinaigrette, pair with roasted beets and goat cheese or cherry tomatoes and walnuts. Arugula is excellent cooked as well. As long as the greens are not overcooked, most of the nutrients are retained. Add to soups, dips, put of pizzas, saute arugula with olive oil and garlic at a medium-low heat. Sprinkle with salt to taste. Delicious!